NASHVILLE, Tenn. — Anna Leigh McGraw, from Camden, Ala., shocked the outdoor world when she recently became the first female to win at the Grand National Turkey Calling Championships since 1994. McGraw, just 9 years old, won the Poults division for youth ages 10 and under. 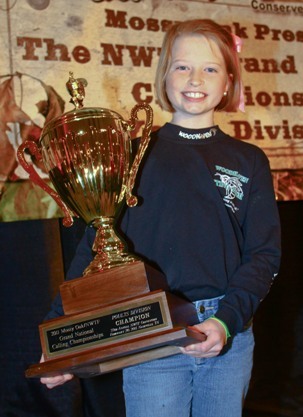 Anna Leigh McGraw, from Camden, Ala., shocked the outdoor world when she recently became the first female to win at the Grand National Turkey Calling Championships since 1994. "It was amazing. I never expected to win," said McGraw, whose father, Sadler, won the Grand National Friction division title in 2009. "Plain hen yelp is my favorite call but I'm best at the fly down cackle." Each year, the National Wild Turkey Federation hosts the Grand National Turkey Calling Championships at the NWTF National Convention and Sport Show. Dozens of the world's best adult and youth turkey callers gather to test their skills in front of a panel of expert judges. Ironically, this year's NWTF convention theme was "Our Youth. Our Legacy.," and as the first female champion at this event in almost two decades, Anna Leigh McGraw is leaving quite a legacy. In the Poults division, sponsored by Mossy Oak Brand Camo, callers imitate the yelps, cackles and clucks of a wild turkey hen. Overall, the winners from each division competed for their share of more than $25,000 in cash and prizes.